Even as interest in feminist theory and criticism in theatre and performance studies continues to wane (or, perhaps, finds itself remapped and redirected), interest in women, autobiography and performance is on the upswing. Auto/biography and Identity enters the field two years after the publication of Sidonie Smith and Julia Watson's collection Interfaces: Women, Autobiography, Image, Performance, but, in some contrast to this earlier text and its emphasis on the visual, Auto/biography locates itself specifically at the nexus between women's autobiographical writing and performance. As Gale and Gardner note in their introduction, by exploring theatrical women's writing about themselves alongside their often multiply-coded, fractious performances of their subjectivities and experiences, they hope to enable ‘connections between texts and performances, past and present practitioners, professional and private selves, individuals and communities, all of which have in some way renegotiated identity through autobiography' (p. 5). The book is divided into three parts, and, as is often the case with edited collections, the divisions often seem somewhat arbitrary. In fact, as I moved from section to section, I found myself revising the book's given structure and imagining a new organizational frame. For example, the opening section, ‘Telling Tales: Autobiographical Strategies’ contains, alongside articles by Viv Gardner on a clutch of turn-of-the-century actresses and Elaine Aston on Adrienne Kennedy's autobiographical pieces, a thoroughly compelling take on Susan Glaspell's ‘disappearing subject’ by Nicola Shaughnessy. In its thoughtful theorization of both the physical place of the playwright and the playwright's own preoccupations with place in her work, Shaughnessy's article might have more productively been read alongside Jen Harvie's evocative and provocative thinking on the work of Janet Cardiff and Tracey Emin in the third section. 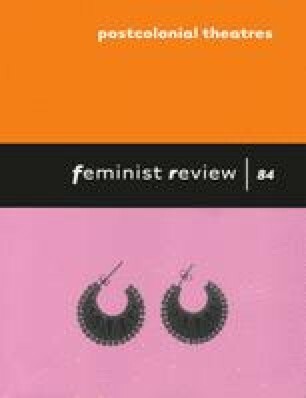 Similarly, readers might benefit from allying Deirdre Heddon's respectful yet interrogative examination of the role performance plays in the construction of lesbian communities in contemporary Glasgow alongside other articles in the collection focused on the pressures and challenges of negotiating minority or marginalized subjectivities – including Gabrielle Griffin's writing on gender-bending performance artist Claire Dowie, and Bella Merlin's informative commentary on Tilly Wedekind's struggle to move beyond her performatic association with the infamous Lulu. These minor structural quibbles aside, I found the book to be particularly strong in sharing detailed information about lives and writings of which many theatre researchers might have no knowledge. The first two parts of the book, ‘Telling Tales’ and ‘The Professional/Confessional Self,’ seem largely focused on theatre history, featuring articles on the self-fashioning of Emma Robinson (by Susan Croft), Lena Ashwell (by Maggie Gale), Tilly Wedekind (by Merlin), as well as Alma Ellerslie, Kitty Marion and Ina Rozant (by Gardner). On the flip side of these historical narratives lies a clutch of articles on contemporary performance artists and community practitioners, though largely UK-based (one exception here is a quick but thorough retrospective of Latina theatre and performance art by Caridad Svich). In all cases, these articles are richly informative, creating a useful introduction to their subject matter for students and professionals alike. And yet, this very virtue also turns out to be the book's greatest weakness. Time and again I found myself yearning for less information and more theorization, for a truly provocative reading – rather than simply a workmanlike reviewing – of exciting subject matter. Some articles do not disappoint on this front: while I had problems with the pseudo-psychoanalytic structure of her analysis, Bella Merlin's commentary on Tilly Wedekind's struggle to assert an independent, extra-theatrical subjectivity free of both Frank and Lulu was utterly fascinating. Meanwhile, Jen Harvie's topical and theoretically sophisticated look at how Cardiff and Emin negotiate women's corporeal experience even as they trouble the sites at (and means through) which that experience may be located is far and away the finest stuff in the collection. Nevertheless, I found it hard not to become frustrated by the uneven quality of the analysis in Auto/biography, as well as by some authors' reliance on old and worn, if not outmoded, discursive and theoretical frames. These concerns aside, I would certainly recommend Auto/biography and Identity to anyone interested in women's theatre history and in contemporary women's performance art in the UK; it offers a helpful overview of what Gardner and Gale rightly point to as a neglected site of investigation – the work women create specifically about themselves, and the politics of that work's creation.